Macauley Cairns saved two penalties for Wakehurst in their Intermediate Cup shootout victory over Orangefield Old Boys. Wakehurst enjoyed some pre-Christmas cheer after a difficult first half of the season, as they continued their progress in the IFA Intermediate Cup at the weekend. For the second time in knockout competitions this season, Paul Muir’s side advanced to the next round after a winning a penalty shootout, after their tie against Orangefield Old Boys finished level at three goals apiece. The match had been postponed due to the weather from week before and conditions underfoot were very heavy for both sides on a tight pitch. After a goalless first half, the match really sparked into life after the interval and it was captain on the day, Lee McClelland who opened the scoring with a well placed, left footed strike from edge of 18 yard box. Orangefield fought their way back and with the help of two errors from Wakehurst, the East Belfast side found themselves 2-1 in front, heading into the last 15 minutes of normal time. Muir threw caution to the wind - moving to a system with three up front to try and salvage the tie and the pressure paid off when an exquisite volley from Jordan Foster found the far corner of the net after an inch perfect cross from McClelland. In extra time, it was Wakehurst who took lead next as Foster kept his cool to send the hosts’ goalkeeper the wrong way from the penalty spot after a harsh handball decision was given against an Old Boys defender. But Orangefield weren’t to be outdone and with virtually the last kick ball of the game, they were rewarded for their efforts as their forward slid the ball home from five yards to level the game a 3-3 and send the tie in to a penalty shoot out. Foster again struck for Wakehurst and with home side hitting the bar, the early advantage was with Wakehurst. 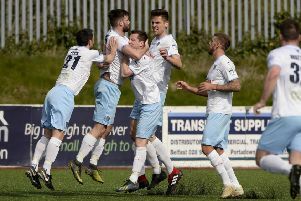 Lee McClelland and Kurtis McCartney found the net and once again, ‘keeper Macauley Cairns was the hero with two fine saves from Orangefield to send Wakehurst in to Round Three, winning 3-0 in the shoot out. There was a positive return from injury for Craig McCaughern as he returned to action with another accomplished performance having stepped up from BMSL. Wakehurst now have no competitive game until 2nd January in next round of Intermediate Cup but play BSML side FC Moylena at Mill Meadow on December 28.